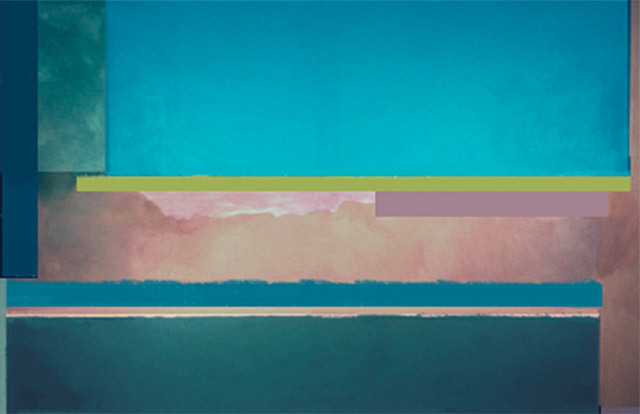 "Making paintings full of complex shapes Virginia mixed a series of hard edge rectangles and set them afloat in color fields where as often as not the fields dissolved into each other. 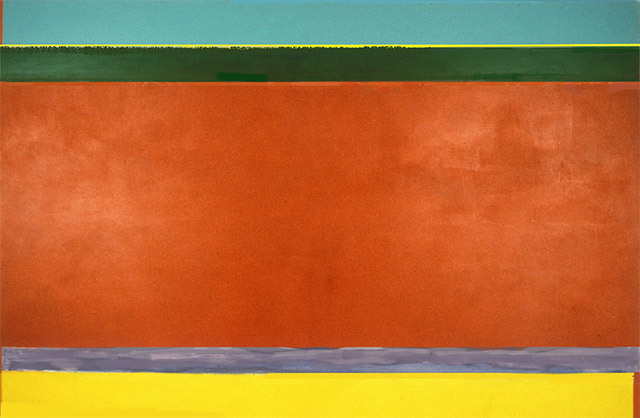 The composition of these paintings owed not a little to the late Hans Hoffman. 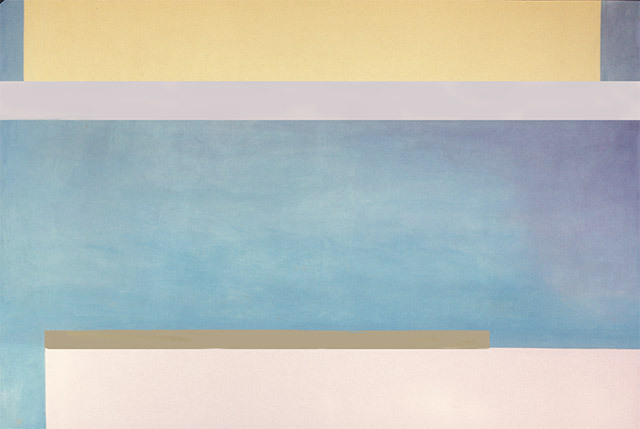 The work was strongly influenced and yet within the paintings carefully mapped out limits Cuppaidge’s balancing of color blocks together with the strange color sense gave the viewer a feeling of openness, of landscape obsessed of another kind of light." "a strong work that holds personal and historical significance in relation to our greatly admired Clement Meadmore sculpture 'Virginia' 1970'. Ron Radford, Director, National Gallery of Australia. In the Collection of the National Gallery of Australia. "At Gallery A Virginia Cuppaidge opts also for a large scale to express compression and tension in her geometric abstract paintings". The intensity of large unbroken rectangles press down on taut thin lines, mixing hard and soft edge color, sometimes dense and uninflected and sometimes scrubbed and changing. 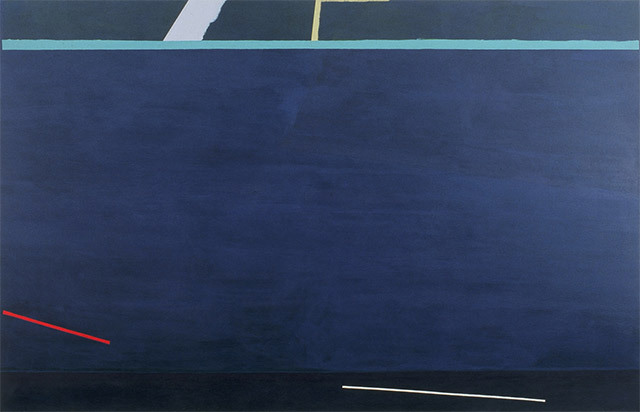 These works that for all their apparent simplicity hold within them slowly revealing subtleties. "She soon discovered that New York is not the easiest place to find your feet. The only phone number she had was that of the Australian born sculptor Clement Meadmore, who she says, "showed me the ropes”. She got a job in Max Hutchinson Gallery, at the time there were only three galleries in SoHo, now there are about 450. By 1973 Cuppaidge’s own work was being exhibited in New York. From article in Artist Profile Magazine by Lucy Strange 2016 When I start a work I get a taste of a colour, I get a visceral taste in my mouth or body that I want to work with.– it has an organic feel to it. I do a lot of layers of colour, in ‘ The Big Orange’ if they were to dissect that painting, you would find several layers underneath, of slightly different colours. It is never flat colour. In the collection of Macquarie University, Sydney. 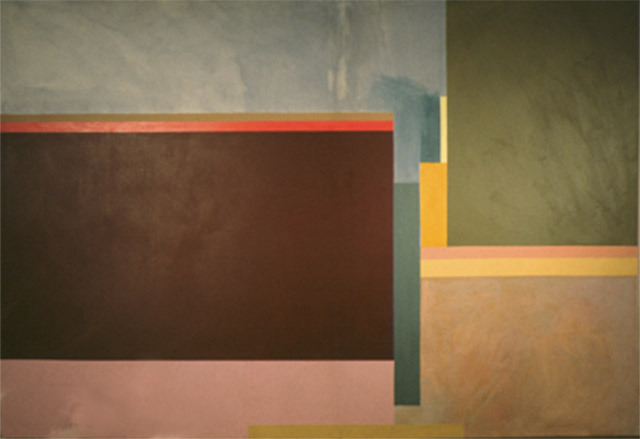 I made this painting in the studio provided me when I was an artist in residence at the University of California in 1975. 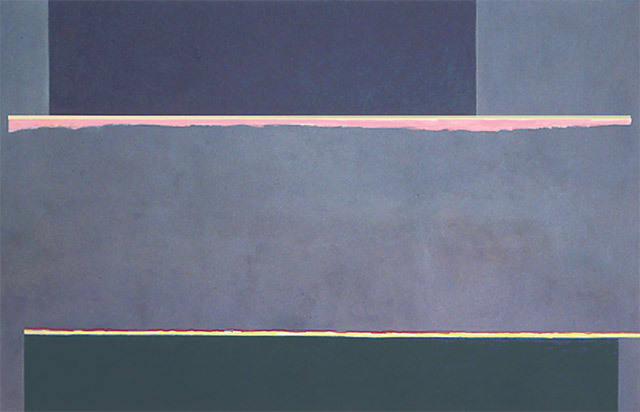 A big influence was Richard Diebenkorn. Some of the most beautiful are a series she painted during a residency at the University of California at Santa Barbara, The Spanish flavor of the environment comes through as a deeply-worked terra-cotta glow off baking plaster walls, and explains what Cuppaidge means when she says that, although she is an avowed abstractionist who is determined to stay ahead of the field, she is also very much a painter from Nature, if not of it. The black green neon glow of New York’s night skyline is as much a part of nature as the sunny glare of California. In the collection of The Art Gallery of Western Australia. ‘Then of decisive importance, was the Mondrian retrospective at the Guggenheim Museum 1972. The work she had seen of the De Stijl painting in Australia was only in reproduction. But now she could respond to the paint quality when seeing actual canvases by Mondrian in the flesh. She realized that carefully structured painting could indeed also be sensuous at the same time. Like a Joycean epiphany, this moment of revelation has stayed with her as she continues her career as a painter.’Peter Selz art historian, 1989 catalogue essay from exhibition at the Stephen Rosenberg Gallery, SoHo, New York. Managing to do many things with a limited vocabulary is of course only one approach and, as in the case of much of the later works of 1960’s minimal artists, the law of diminishing returns can too easily set in: less rather than being more can dwindle down into little indeed. 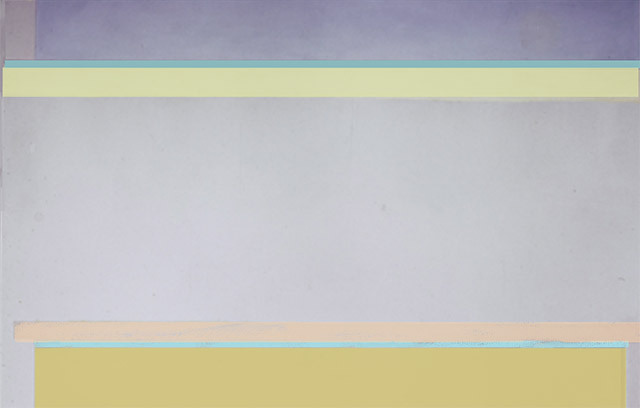 Cuppaidge’s narrowing of her formal vocabulary to date, however, has enabled her to achieve highly complex results in terms of color and light. 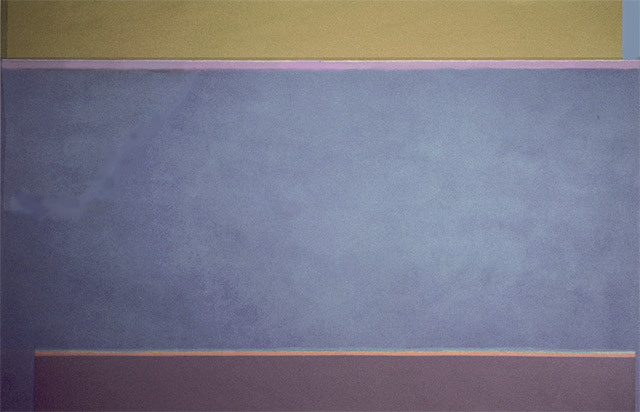 The artist achieves a similar effect in SECOND TRANSITION with its fading pink-into-gray field forming the center ground of the canvas. The vertical color bands along the edges set out the horizontal blocks without defining where ‘out’ is, thus causing them to float. Finally light adheres differently to the hard as opposed to a soft painted surface. Cuppaidge manages to combine these surfaces and yet maintain the consistency of the light. In the collection of The Art Gallery of South Australia. She wanted to delve beneath the surface of her paintings. The middle of WAKENDA began as a dark charcoal grey but, influenced perhaps by the skyscapes, she wanted to lift and soften the surface. To this end she painted the bottom of the painting a soft pink. Then one of those accidents of art occurred – gradually she found the pink fading into the darker grey and she had achieved a soft misty surface. Although her formal art training led her momentarily to question the "authenticity of a technique that allowed colors to fade into each other, she now knew that a delicate, taut surface was possible. She wanted to achieve the light of the sky in paintings; the surfaces were to be light rather than colour and she would use the coloured shapes like "sparklers that would intercept light with light’. Her vision in tact, she began to experiment with the technique in a new series of paintings. Virginia always wanted to be an artist. Born in Brisbane in 1943 she moved to Sydney when she was 18 and studied at the now "sadly” defunct artists school The Mary White Art School where people like Olsen and Rapotec taught. Virginia is now her own painter, guest lecturing or teaching occasionally and returning to Sydney for her current show at Gallery A, timed always to coincide with the heady exuberance of Australia’s summer. In the collection of The Art Gallery of New South Wales. 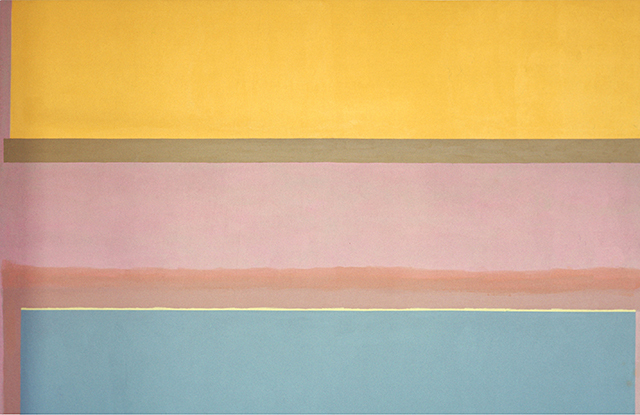 Cuppaidge’s highly charged color sense made itself felt in her first solo exhibition in 1973 at AM Sachs Gallery. 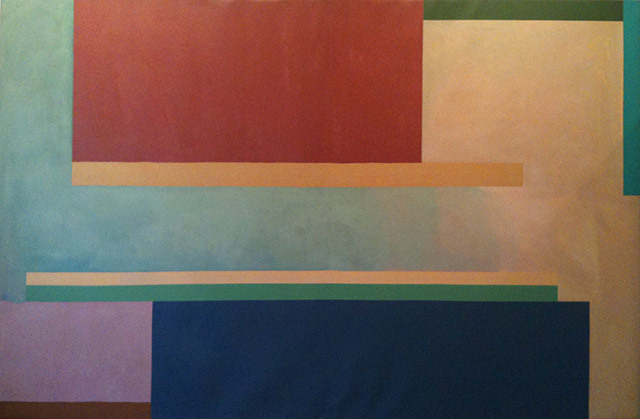 Making paintings full of complex shapes she mixed a series of hard-edge rectangles and set them afloat in color fields where, as often as not, the forms dissolved into each other. The composition of these pictures owed not a little to the late Hans Hofmann. 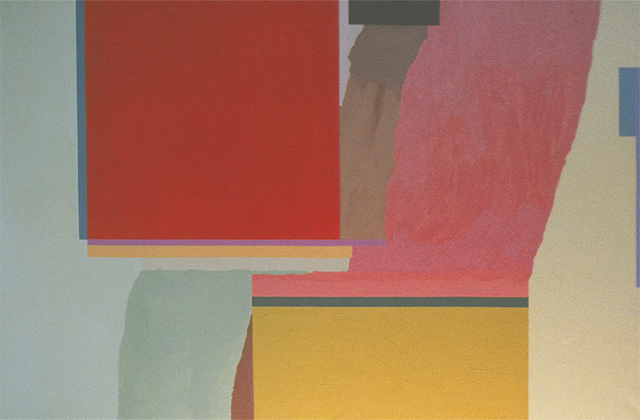 The work was strongly influenced and yet, within the paintings’ carefully mapped out limits Cuppaidge’s balancing of color blocks together with her strange color sense gave the viewer a feeling of openness, of landscape obsessed of another kind of light.